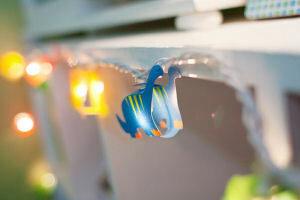 Baby Oliver's Blue, Green and Brown Dinosaur Themed Nursery with Polka Dots and homemade decorations. Baby Oliver's baby blue, green and brown dinosaur themed nursery was once Mom's scrapbooking room but there is not one shred of evidence that this was once a hobby space; this room is an all-boy dinosaur nursery now! 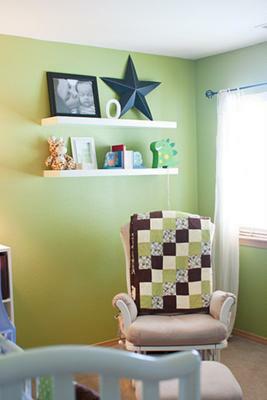 The shelf behind the nursery rocker is decorated with items that my friend, Nicole, gave him. One of the gifts was a wooden block that has something engraved on each side. It's personalized with our baby boy's name, his birth information a favorite quote, etc. 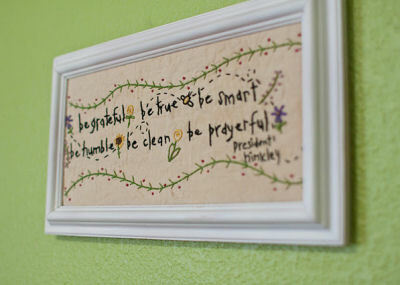 The framed "I Am a Child of God" print behind it was purchased from another Etsy store. Many of the dinosaur themed decorations that we bought for the nursery came from Kohls! The dinosaur table lamp and the string of lights all were marked down and we since we also had store coupons; they were just too cute and we just had to have them! The little string of lights creates such a cozy atmosphere at night when all of the other lights are turned off. We were so lucky to find a matching wooden growth chart that we will use to chart his information when he is older. We hung it on the side of the nursery closet shelf for the time being. My mom made the patchwork quilt that we have on display on the side of the baby's bed. The fabrics that she used to make it look amazing with the rest of the bedding including the sheets that are Dwell Studio from Target. I chose to buy a breathable baby bumper from Amazon and I'm so glad that I did! It makes me more easy to know that there is not danger of suffocation should he happen to be against it and yet it offers protection from hitting his head against the crib rails. The mobile that we chose is the Wimmer-Ferguson Infant Stim-Mobile (another Amazon purchase) I love the shapes and colors of his mobile and so does he. When he looks at it he giggles and babbles to himself and seems to be memorized by it; it's just so cute! My mom also found the changing table that she bought us for our Christmas present last year from Amazon. 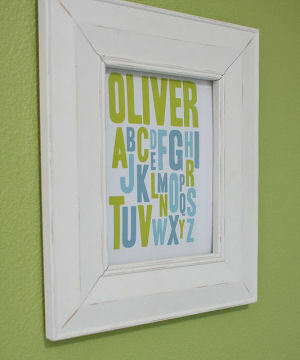 And the framed print with our baby boy's name and letters of the alphabet that we hung above it was another Etsy find. My mom created this piece of embroidered artwork that decorates the wall above his CD player on the other side of the room. I hope that you have enjoyed hearing how we decorated Oliver's baby blue, green and brown dinosaur themed nursery and hope that you like our baby nursery ideas and to see more pictures, please visit my blog A Beautiful Life! Just wondering where you bought the bedding? Thanks! Super cute room! Everything about this nursery rocks! I love this room, it is so cozy and inviting. 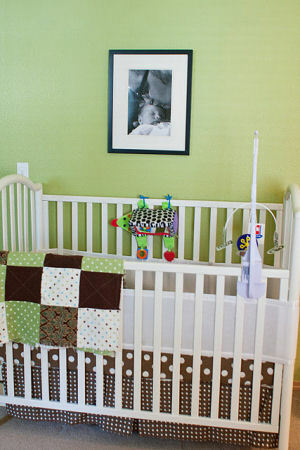 Oliver is very lucky to have such a cute nursery. I love the color theme, and I love that it is personalized for him. I love the colors and theme! You've got my vote! I love this room...soo cute! So cute. Love the colors and the cute dinosaur theme! I love the room and all the love put into it! one more place to exhibit your talents! ya'll did a beautiful job with this project! I love the dinosaur theme! very cute. I love the color scheme. Very cute, fresh and beautiful! Good job, mommy! Join in and write your own page! It's easy to do. How? 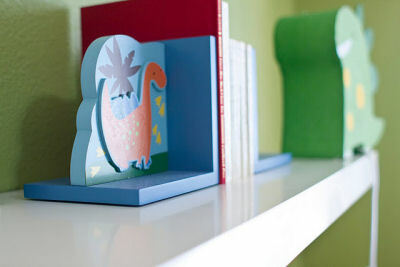 Simply click here to return to DINOSAUR NURSERY PICTURES and DECORATING IDEAS.